Ginger is among the healthiest spices on the planet. It is full of nutrients and bioactive compounds that have amazing benefits for your body and brain. Ginger once was considered a luxury spice more than 5,000 years ago . 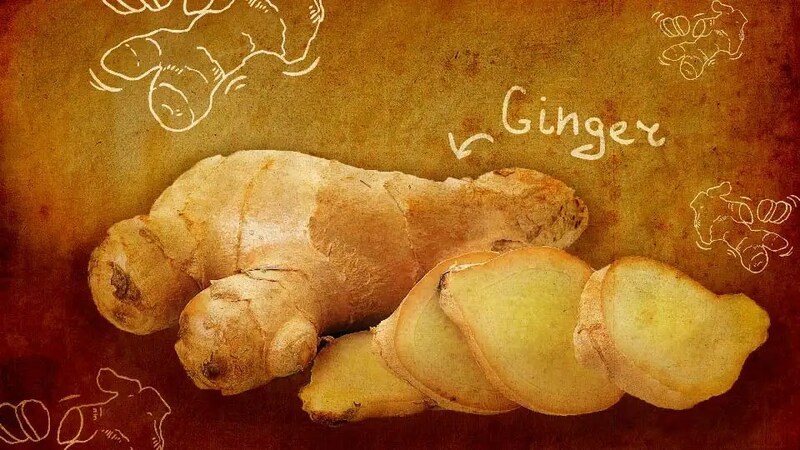 The Indians and ancient Chinese used the root of ginger as a tonic to treat common ailments. Although ginger originated in Southeast Asia, it has a long history of being used in other countries. 16 Health Benefits of Ginger, 10 are by Dr Axe! Ginger may have powerful anti-diabetic properties. In a recent 2015 study of 41 participants with type 2 diabetes, 2 grams of ginger powder per day lowered fasting blood sugar by 12% .It also dramatically improved HbA1c (a marker for long-term blood sugar levels), leading to a 10% reduction over a period of 12 weeks. There was also a 28% reduction in the ApoB/ApoA-I ratio, and a 23% reduction in markers for oxidized lipoproteins. These are both major risk factors for heart disease. One of the traditional uses of ginger is for pain relief, including menstrual pain. In one study, 150 women were instructed to take 1 gram of ginger powder per day, for the first 3 days of the menstrual period. Ginger managed to reduce pain as effectively as the drugs mefenamic acid and ibuprofen. Bottom Line: Ginger appears to be very effective against menstrual pain when taken at the beginning of the menstrual period. Ginger appears to be highly effective against nausea . For example, it has a long history of use as a sea sickness remedy, and there is some evidence that it may be as effective as prescription medication . High levels of LDL lipoproteins (the “bad” cholesterol) are linked to an increased risk of heart disease. The foods you eat can have a strong influence on LDL levels. In a 45-day study of 85 individuals with high cholesterol, 3 grams of ginger powder caused significant reductions in most cholesterol markers .This is supported by a study in hypothyroid rats, where ginger extract lowered LDL cholesterol to a similar extent as the cholesterol-lowering drug atorvastatin . Oxidative stress and chronic inflammation can accelerate the aging process. They are believed to be among the key drivers of Alzheimer’s disease and age-related cognitive decline. Some studies in animals suggest that the antioxidants and bioactive compounds in ginger can inhibit inflammatory responses that occur in the brain .There is also some evidence that ginger can enhance brain function directly. In a study of 60 middle-aged women, ginger extract was shown to improve reaction time and working memory. There are also numerous studies in animals showing that ginger can protect against age-related decline in brain function . Ginger has been shown to be effective against exercise-induced muscle pain.In one study, consuming 2 grams of ginger per day, for 11 days, significantly reduced muscle pain in people performing elbow exercises .Ginger does not have an immediate impact, but may be effective at reducing the day-to-day progression of muscle pain .These effects are believed to be mediated by the anti-inflammatory properties. Osteoarthritis is a common health problem. It involves degeneration of the joints in the body, leading to symptoms like joint pain and stiffness. In a controlled trial of 247 people with osteoarthritis of the knee, those who took ginger extract had less pain and required less pain medication . Another study found that a combination of ginger, mastic, cinnamon and sesame oil, can reduce pain and stiffness in osteoarthritis patients when applied topically . Best Ways to Use Ginger by Dr Axe. Ginger ale is a simple yet easy treat that is packed with beneficial enzymes and probiotics. Place the water in a pot and bring it to a boil. Add the ginger. Lower the heat and allow to simmer for 5 minutes. Strain the mixture through a mesh strainer. Add the remaining ingredients. This entry was posted in Uncategorized and tagged #ginber, #ginger, #gingerale, #gingerdrink, #gingerhealthbenefits, #gingertea, #superfood on November 15, 2016 by thehypothyroidismchick. It’s amazing how much ginger can help you! I had no idea that it can help fight against heart attacks and strokes. My grandfather died from a stroke, so I want to stay far away from that problem. Yes, Ginger is a wonderful thing to start to eat. Also, garlic is fantastic too.